Fishing is not the only hooking that’s been going on this summer. 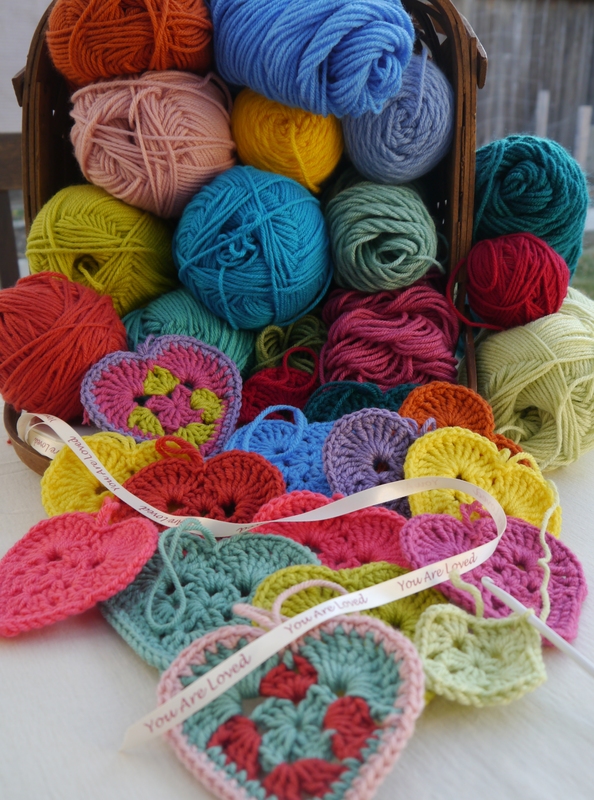 I’ve also gotten quite a bit of crocheting done recently… surprisingly. A huge creative surge of ideas has taken over my brain lately, which is always a great place for my brain to be…it’s the hands that don’t always have the time to follow through. (This is the story of my life and I have gotten quite used to navigating its territory, so I’m not pitying myself by any means.) 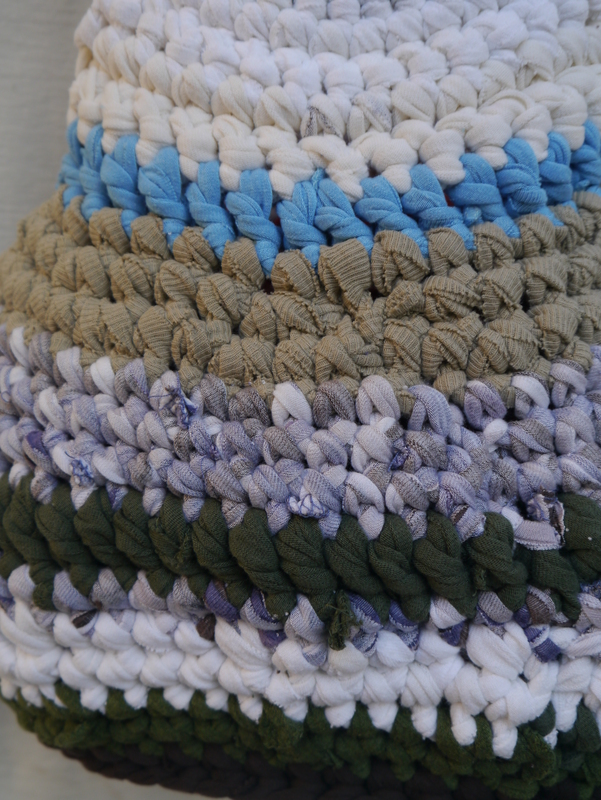 I fantasize about colors and textures, about turning paintings into abstract needlepoint, about crocheting with leather and cassette tape and of course more t-shirt yarn, and dreaming of huge crocheted sculptural hanging pods (I’ve been revisiting my Ruth Asawa books). There is a glaring mistake in the edging on this mandala, which I ended up fixing before I sent it off…I just forgot to photograph it! Lots and lots of new ideas, and yet I keep returning my attention to the You Are Loved project and how to move it forward. 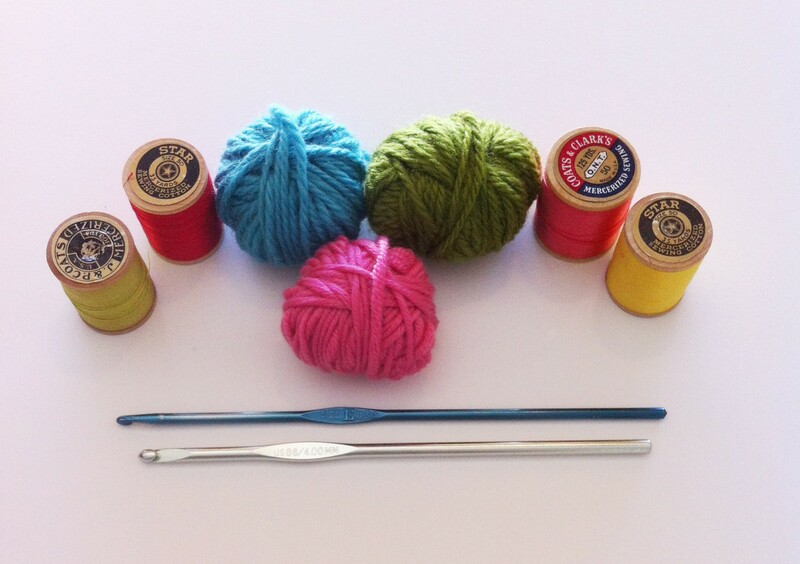 It’s become my crochet child…always looking out for it and trying to find the best way to guide and nurture it. 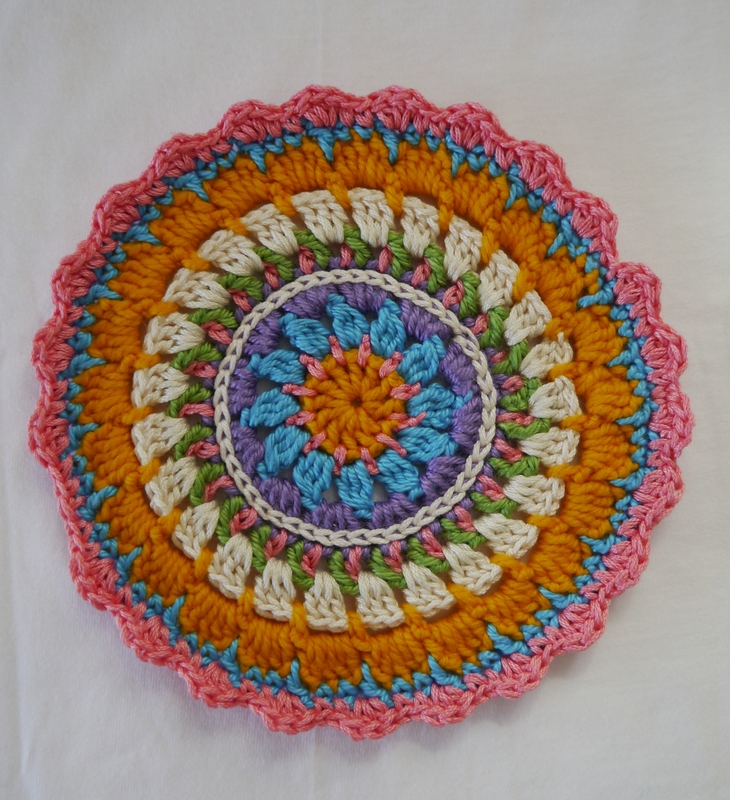 Recently I finished a mandala to send to Lucy, creator of the beautiful and inspiring British crochet blog, Attic24. I have been following this blog since I began writing my own over 2 years ago. 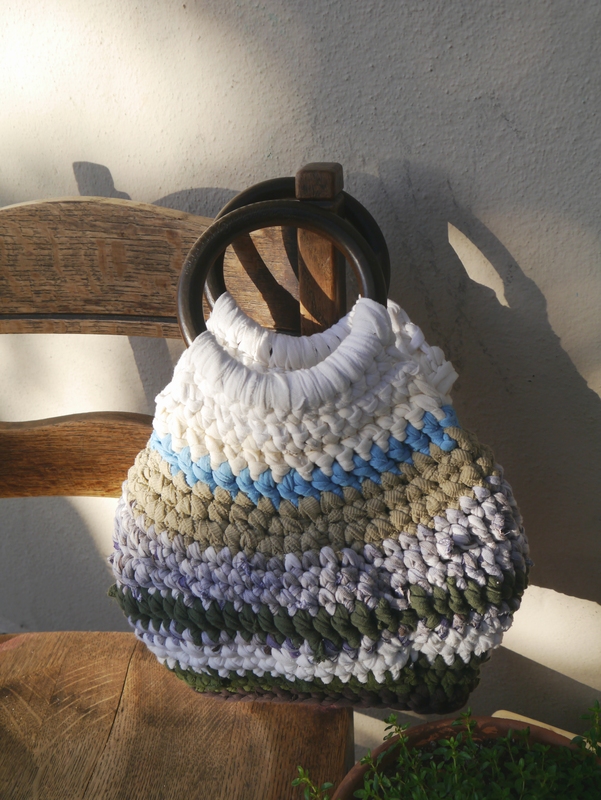 I love her colorful lifestyle and her passion for all things handmade. 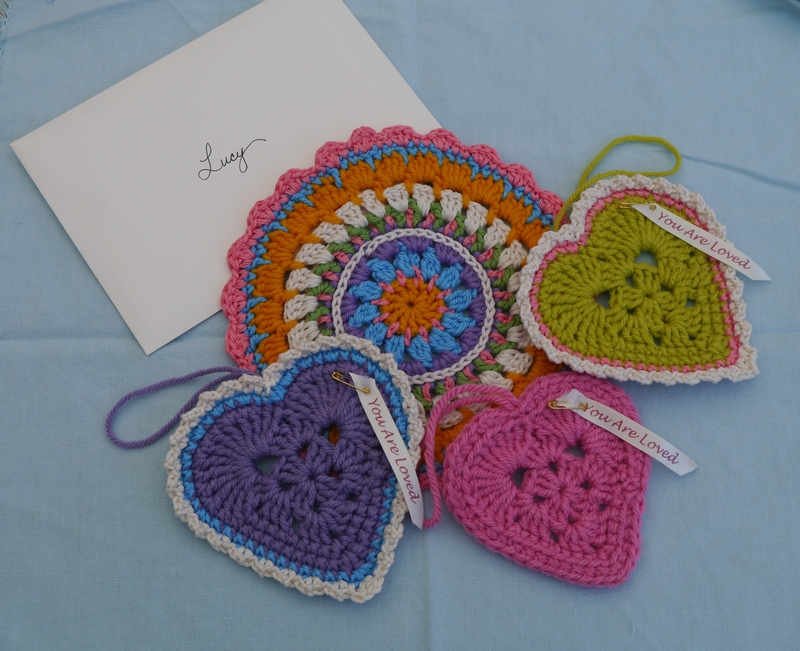 Last year, she spearheaded a project that had people from all over the world crocheting a granny-triangle that would be made into a HUGE bunting to be hung at a yarn festival in Yorkshire, called Yarndale. 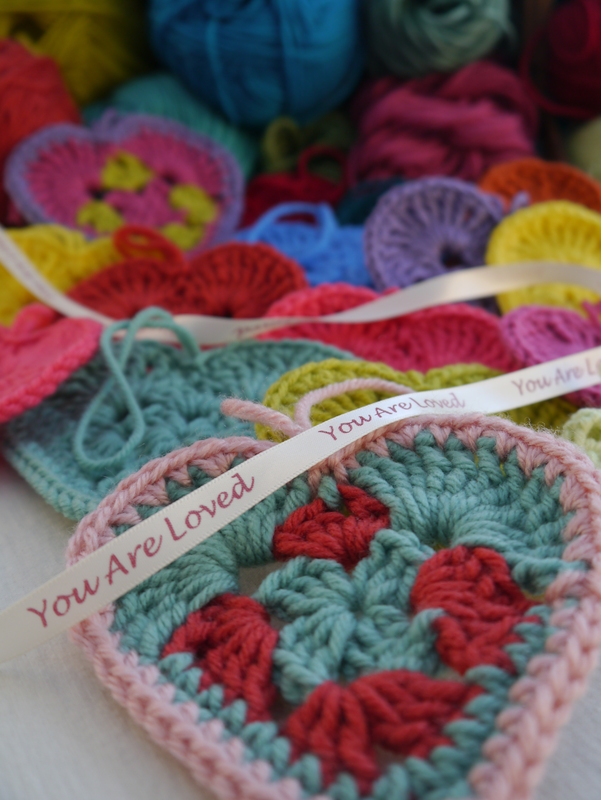 When I saw the post about the bunting, it was shortly after I had begun making hearts for “You Are Loved”. I was so moved and inspired by the idea of hand-workers from all over the world creating a single, unified item of beauty. 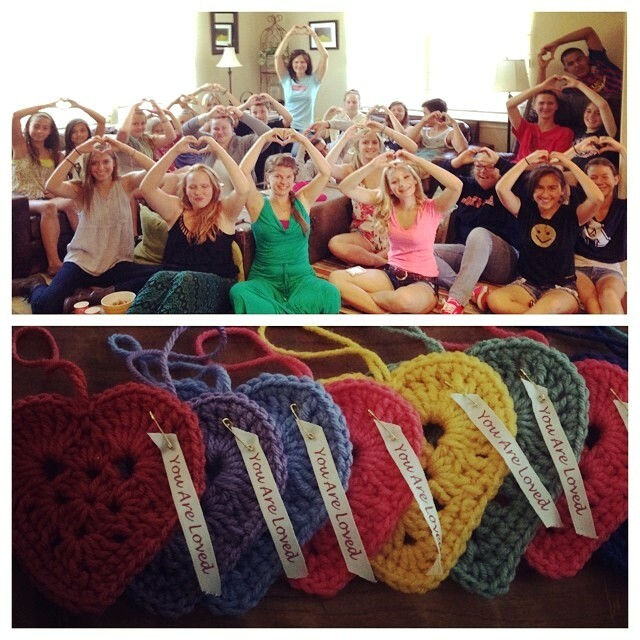 I’ve always had aspirations of the “You Are Loved” hearts not only to be shared by people all around the world, but to have a collective “crochet-a-long” take place, much like how the bunting was made. So, I wrote Lucy a letter and asked for her opinion and to see if she might have any ideas for me on how to get a project like this started. I know she is a busy, busy person at the moment, so I don’t expect a reply any time soon. But it felt good to put my intention down in writing and share the idea with her. In the meantime, the hearts are making their way around Napa, that’s for sure. I’ve had several occasions recently to share the love in so many awesome ways. One in particular that made me quite happy was seeing my friend, fellow love- ambassador and chiropractor, Dr. Rhea share the hearts with a group of teenagers taking part in our local Roots & Shoots chapter, a program founded by Dr. Jane Goodall in which teenagers work together to make our world a better place through local and global humanitarian projects. This is what it’s about! Community, connectivity and creativity…reaching out to others and living a love-filled life, making people happy, sharing our gifts and helping each other. I know that “You Are Loved” has a place in this world…it’s slowly growing and spreading wings, just as it should. And as it does, I’ll just keep right on playing hooky.